Browse some commonly asked questions, or ask your own! Can you explain how multiple power usage readings are aggregated to a single unit. Also how temperate probes, both environment and liquid are added. Another application is battery monitoring (which is DC). There are many methodologies and solutions for getting information into the Adroit M2M platform. The diagram below shows that we simply connect analogue, digital or serial communication inputs via one of our many hardware solutions. The information is then sent to the platform via our Adroit M2M protocol. The protocol handles real time and historical data and compensates for any network downtime or delays. 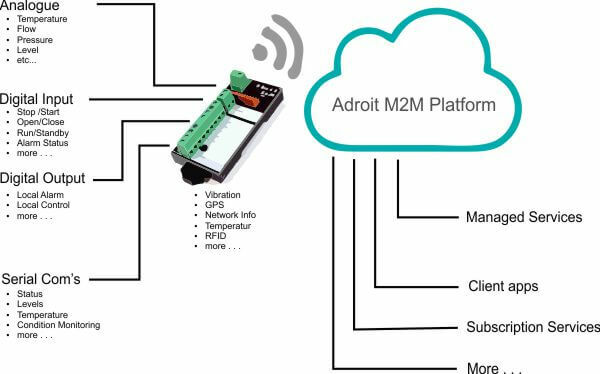 Multiple pieces of hardware are connected to the Adroit M2M Platform. Please call us or send the form below for more information.